The Puente Hills Landfill – formerly the nation’s largest and deepest – has been the final resting place of more than 130 million tons of trash since 1957. The landfill took in trash from all over LA County, becoming the go-to repository for most of Los Angeles’ garbage. Due to a conditional use permit negotiated in 2003 by the county Board of Supervisors, the landfill closed for good in 2013. Since the closure, The County of Los Angeles Department of Parks and Recreation, with Withers & Sandgren Landscape Architecture + Planning have been leading an extensive master plan process, which included an unprecedented community engagement effort to upcycle and recreate the area into a new county park. The plan calls for an entry plaza and a 7,000 square-foot visitors center that will take park visitors via a shuttle bus or gondola to the top of the site. The plan also calls for 14 miles of multi-use trails for hiking, biking and horseback riding. Also planned are picnic areas and play areas for children. 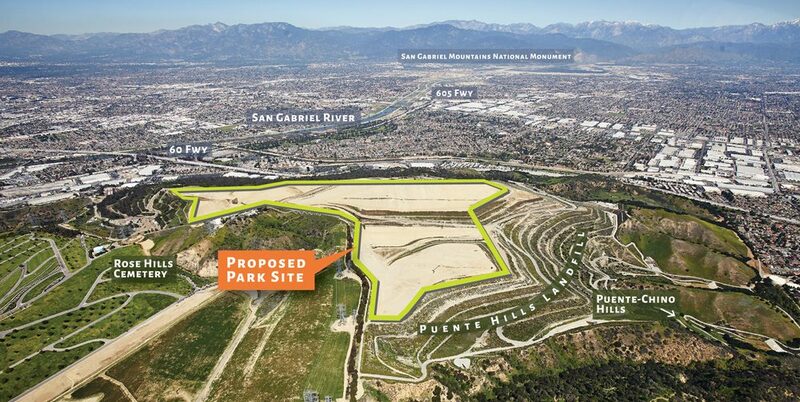 Increase public awareness and increase community participation as the Puente Hills Landfill Park Master Plan advances through the approval process. VPE supported the Puente Hills Landfill Park Master Plan to recreate and upcycle the Puente Hills Landfill, transforming it into a “Park for All” that offers a variety of healthy and active recreational experiences and programming for visitors of all ages, abilities, interests and backgrounds. Developed online version’s of media kit that was posted on the Puente Hills Landfill Park website. Writing and disseminating news releases, coordinating media events, and issuing calendar announcements. Created social media presence, created original content, managed engagement and evaluate activity on Puente Hills Landfill Park’s Facebook, Instagram and Twitter. Developed a Change.org website page to generate community support for Puente Hills Landfill Park Master Plan.